So yesterday I had two events to attend. Well actually one event, and one meeting. 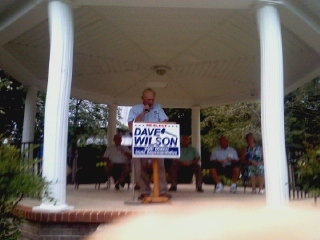 The event was for my Representative, Dave Wilson. Rep. Wilson was announcing his re-election campaign kick-off for the 35th District, and had invited friends, supporters, and the general public to come out and join him for some really good ice cream from the local dairy farm owned by the Vanderwende family. I enjoyed a bowl of peanut butter ice cream myself, very good. Yes Steve, peanut butter! Many of Rep. Wilson’s Republican colleagues came out to honor him and share the moment. Sen. Brian Pettyjohn acted as MC, introducing Pastor Rick Betts from Crossroads Community Church to give the invocation, which was followed by Sussex County Sheriff candidate, Robert Lee, leading those gathered in the pledge of allegiance, which was then followed by the singing of the national anthem by his wife Lori. Then came comments from Senate Minority Leader, Sen. Gary Simpson, who in turn introduced House Minority Leader, Danny Short. Both spoke of the hard work of Rep. Wilson, and his dedication to his constituents. Rep. Wilson then spoke, and thanked everyone for coming out to enjoy some ice cream and fellowship with him. He thanked everyone for their support through the years and asked for continued support for his re-election. He spoke of the fact that he was born and raise in Sussex County and that his family had been in the farming business for over a hundred years. I would like to add that Rep. Wilson is my representative in Dover, and while I have at times not been in full agreement with some of his votes, I have always found him willing to listen and to explain his position on issues. We should not expect to find elected officials that will vote the way we feel one-hundred percent of the time. We should remember that they have to also represent the other people who live within their districts, and this will cause from time to time, them to cast votes that are not in line with our views. The question when we vote should be, has Dave Wilson been consistent? Has Dave Wilson been honest? And has Dave Wilson stood fast on his convictions? I can honestly answer for my part, yes. Thank you Rep. Dave Wilson. And as I read the Delaware website, Rep. Wilson has no opposition as of right now. This could change however, so I will save my congratulations until a more appropriate time. So after an enjoyable hour and a half and some very good ice cream, I decide to punish myself, and ride over to Georgetown to see what was happening at the monthly meeting of the Sussex County GOP Executive Committee. Now I knew what was going on really, this was the Sheryl Valenzuela smoochi fest night. Ms. Valenzuela had decided at the final tick of the clock on the filing deadline day, to file, and to force a primary against long declared, and previously filed candidate Ken Simpler for the office of Delaware State Treasurer. Have to say that the reaction for Ms. Valenzuela’s last-minute decision has not been all rosy. But in the Executive Committee of the Sussex GOP I knew she would find fringe support. So when I arrived, I found her in the middle of her dissection of why she has chosen to run. Now as I was not present for the beginning of the speech I am relying on the written notes of someone else whom I trust. I say it was the dissection of why she is running, but really it was the dissection of Ken Simpler. It seems as though Ms. Valenzuela is not running because she thinks she can do a good job, she seems to be running because she doesn’t want Ken Simpler to have the job. She made a point of saying that she decided to run because no other conservative is running. So here we go again, the “I am more conservative than you” argument. She focused almost entirely on his past and his qualifications to be Treasurer, and spent very little time on her own. One theme that she seems to be stuck on, is the fact that Mr. Simpler had the shameful (her view not mine) audacity to want to invest his own money in building a new casino at the beach. She also pointed out that he was partnered in this development project with the son of a former state senator. Ms. Valenzuela seems to find it distasteful that a private citizen would dare to propose a project that might earn them some money. 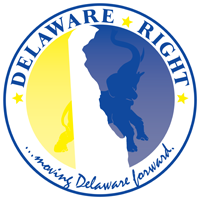 Now personally I don’t support expanding gambling in Delaware, not because of some pretended self-righteous moral position, but because it has been a failure. However, why should I care if a private investor wants to throw their money away? If I am going to be upset, it is because my state government is involved. To make the connection that because Mr. Simpler wanted to invest in a casino in the past, and that if elected as Treasurer he would again find a way to make that happen in the present, one would have to have no understanding of how state government works, or the powers of the office they are running for, but more about Ms. Valenzuela later. Another point of contention for Ms. Valenzuela with Mr. Simpler is the fact that he is a hedge fund manager. This is a person who finds troubled companies, buys them, cuts the waste, closes them, re-opens them, and makes money. Now in Ms. Valenzuela’s world this is a bad thing, but to me it sounds like exactly the type of mentality we need in government right now. We need someone who recognizes where waste exist, and how to maximize output and spending in order to save tax payer money. So in my view Ms. Valenzuela has chosen to attack Mr. Simpler on two points that in the one case makes her look as if she is against good old American capitalism, and the other case she has given a good reason why Ken Simpler is the perfect person for the office. Now the fact that Ms. Valenzuela has chosen to attack Mr. Simpler on wanting to invest his own money in a capital venture is also ironic, since she has been touting her start-up business since her failed run for Lt. Governor in 2012. The difference being that Mr. Simpler was going to invest his own money and that of anyone who wanted to invest. In Ms. Valenzuela’s case she used grant money. Oh! Wait, that’s right this question came up last night as well. When asked to explain her use of grant money she clarified that it was not “grant money”, it was “state resources”. I’ll wait and let that sink in for a moment. Ready? Head stopped spinning around on your shoulders yet? Okay so money from the state in any name, grants, resources, whatever she wants to call it, is good. Investing private money is bad. Sorry, lost in translation. Of the five or six people who stood to ask questions afterwards, only one would be classified as friendly, actually it might even have been a back-handed endorsement from the dais. The Parliamentarian, Miguel Pirez-Fabr gave what amounted to a testimonial and never did ask an actual question. So much for not being involved in primaries, another of Chair Reiley’s so-called rules down the toilet. I may have miscalculated the amount of support in the room for Ms. Valenzuela, I am positive she did. Now to tie the two events together I go to my former 35th RD Chair Matt Opaliski. In the past I have been critical of Matt Opaliski due to the fact that he was rarely present at the monthly Sussex EC meetings, and had not held a 35th District meeting in months. So last night while the incumbent Republican Representative for the 35th District was announcing his campaign, and thanking people, and asking for continued support. Where do you think Matt Opaliski was? 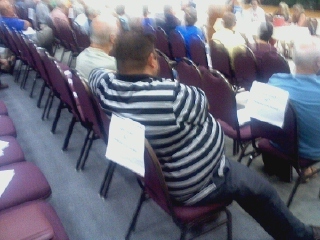 Was he in Bridgeville standing with his Representative? Nope, he was in Georgetown at the very monthly meetings that he had shunned in the past. By the way Matt, the “R” in RD Chairman stands for “Representative”, just saying. 23 Comments on "Tale Of Two Events"
Of course the 35th RD wasn’t around for months he was to busy attending the county sheriffs constitutional classes. Clearly those were far more important, than representing the constituents in the 35th. He couldn’t attend Rep. Wilson’s event but he manned the county sheriffs booth all day in Seaford this past weekend as a member of the sheriffs posse …….oops “support team”. That pretty much sums up what the priorities are and where the 35th RD has his head. Hopefully the sheriff doesn’t stop short. Aw come on Frank. Matt attended the monthly meeting of the Sussex GOP and, instead, you think he should have gone to a campaign stop? You’re criticizing him for allegedly not holding monthly RD meetings like he should but think he is wrong for going to the mandated monthly meeting? I enjoyed your assessment of Valenzuela and the reaction to her sudden and surprising candidacy. I think you’re very right….Sher was not greeted with the enthusiasm she expected. I was there as well. Sher got a terrible reception. All of the questions were negative. And you misheard Miguel. He was clearly endorsing Simplers qualifications and rejecting Sher’s talking points about turning the Treasurers office into DEDO, or as it’s otherwise known, the 2010 Chip Flowers plan. I also loved how Sher was lying through her teeth about Simplers casino plan and everyone in the room had the truth on a sheet of paper from Simpler. That was smooth. What? Where did you get this notion? Hedge funds are like mutual funds for the wealthy. They are open to a limited number of investors and they require a very large minimum investment. Originally, they were called “hedge” funds because the goal was to reduce risk of a bear market. But nowadays, hedge funds make speculative investments that carry greater risk. Big hedge funds include Goldman Sachs Assets Management and JP Morgan Asset Management. You’re describing corporate raiders such as Carl Icahn and Al “Chainsaw” Dunlap. Ken Simpler is not a corporate raider! Valenzuela wants to take the money from the Treasury that is invested in stocks and bonds, and she wants to start doling it out to businesses like DEDO does. Which is just what Delaware needs, another state agency picking winners and losers and flushing our money down another Fisker or Bloom Energy toilet. Forget about her school bus sized social baggage that she’s carrying around, forget the fact that our tax dollars have been keeping her business funded for years and our tax dollars also pay for her income which comes from government contracts, and forget about the fact that she says she owns a $10,000,000 a year business but the City of Milford pays her electric bills, just the fact that she wants to turn the State Treasury into another DEDO should get her run out of town on a rail. Time to grab the torches and pitchforks, she’s about as much of a conservative as Barack Obama. We should not expect to find elected officials that will vote the way we feel one-hundred percent of the time. Unless their name is John Atkins. As I understand it, Simpler graduated from Princeton and holds a MBA and a JD (law degree) from the Univ. of Chicago. Concidering his level of education and his business experience, in what way does Valenzuela feel his “qualifications” for Treasurer are lacking? If the “Sher On The Dole” post is correct, then she has some explaining to do; people who live in glass houses shouldn’t throw stones. Rick, can we start with her taking $301,000 from Obama’s 2009 Stimulus? This post is so full of your negativity, I don’t know where to start! Ricky I sure hope Ayotte doesn’t stop short. Any professional journalist would have waited until the close of court activity on 15 July 2014 before posting anything. The list of misinformation on issues is well documented, Ayotte and his groupies always come up with some lame excuse to cover his blatant distortion of the known facts. Fish is a joke, Ayotte is a joke, sadly so too has Delaware Politics become a joke due to the repeated grocery store tabloid crap written by these clowns. So you liked when Atkins voted on HB 265 to raise tax on business. You liked his vote to lower punishment on deug crimes? So does that make you a “RINO” , maybe a DEM cause i have certainly see you criticize good republicans who voted no to these measures. Sher did not “take” $301,000. It was a loan. So was the $535 million that the government loaned to Fisker. What’s your point? Still taxpayer money being used to support private industry. Sher On The Dole, crushes the serve!! In your world, no matter what Opalinski does he’s wrong. What did you do when you were an RD Chair? Oh, that’s right, you were never an RD Chair. When you were an ED Committee person you were supposed to organize the Republicans in your Election District. Did you ever go out and meet any of the people in your district? If not, you failed at the job. So you liked when Atkins voted on HB 265 to raise tax on business. You liked his vote to lower punishment on deug crimes? What if Atkins had voted “no?” Nothing- the bills pass. Frank said that (paraphrase) we should’nt reject a candidate simply because we don’t agree with every position they take. But that’s never his position with Atkins. Not to worry- Atkins will likely be replaced by a develop-every-cornfield yes-man in the fall. 1. Fisker folded up shop leaving the huge loan unpaid and taking the jobs out of the country. Sher is still operating in Milford and paying back the loan that compared to Fisker’s is insignificant. 2. You attempted to mislead the other three readers of this bogged blog by saying she took the money instead of telling the truth in that it was a loan. If I give money to a start upand they “take” it, I am supporting them. If I loan money to a start up, I am helping us both by investing my money in their venture in hopes of a return on my investment. Big difference. I am guessing you are in favor of closing up the SBA? Really? Some Government programs actually work sometimes. Fisker was not an SBA loan by the way. Ricky Bobby crushes the serve! So in Ricky world there are no private investors? No way to get a loan other than from “State resources”? A so called conservative that relies on government loans as opposed to private? Who has supported gambling by taking inflated government contracts to reupholster the chairs at the casinos? And yet is criticizing the person she is challenging for supporting gambling? Sorry Ricky, too many question surrounding Sheryl. Ricky — The problem is that Sher criticized the government for lending money to Fisker. It’s called HYPOCRISY, and Sher is covered in it. The point is this: Sher Valenzuela’s business would not exist today had it not been for the intervention of government programs. She said so herself. So when she criticizes government spending and taxes, she reveals herself to be a hypocrite of the highest order. There’s another point; Simpler is more qualified to handle modern finance. Maybe Sher the Welfare Queen needs to tell the voters how much her company has taken in government loans, grants and give a ways like when Milford pays her electric bills. She should also let the voters know how much of that money is still outstanding. Did we pay for her multiple abortions, too? How do you make that leap? I wrote,”If I loan money to a start up, I am helping us both by investing my money in their venture in hopes of a return on my investment.” This describes me lending my own personal money to someone else. I am in favor of personal loans and private investing. Another huge leap! Because she won a contract she supports gambling? I truly doubt the state issued a contract “to reupholster the chairs at the casinos”. It seems the casino owners would be responsible for reupholstering the chairs at their own casinos. Can you back your statement up or is it just another Frank Fantasy? Don’t be sorry for me. I never said I supported her. I was only pointing out that she never took money, she received an SBA loan. How many other businesses got their start in the same fashion? Do you begrudge those loans also? I say we find the idiot that came up with the SBA idea and pin a medal on him. The conversation was about Sheryl taking money from the government as opposed to finding private. You jumped to her defense. It is no larger a leap to se Sheryl as supporting gambling by taking gambling dollars to upholster chairs, than it is for her to say Simpler supports gambling because he was going to develop a land deal for a casino. I am merely pointing out her hypocrisy. And if you take the time to look at the state’s share of the revenue, it is clear the state of Delaware is a partner in the casinos, so anything the casinos do the state is a part of. Okay Ricky obviously has a problem with context. So Ricky, how many of those other company’s owners then run for office while condemning out of control government spending? You see, it is again about hypocrisy. And can you tell us she has paid back the so called loan?